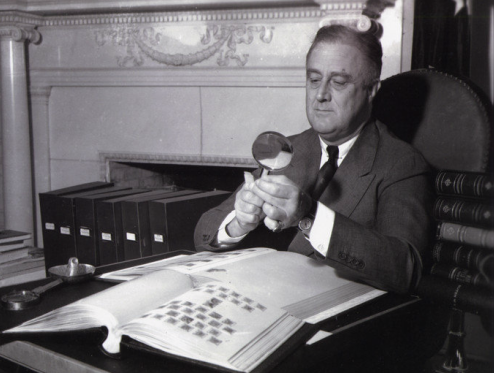 ¶ 2 Leave a comment on paragraph 2 0 From the campaign through his presidency, FDR’s stamp collecting activities were highlighted in the mainstream and philatelic press. During the presidential campaign of 1932, the Wall Street Journal discussed the candidates’ hobbies telling readers they were choosing between an avid fisherman in Herbert Hoover and a voracious stamp collector in Roosevelt. George W. Linn, publisher of Linn’s Weekly Stamp News, openly endorsed FDR by printing on the front page of his widely-read philatelic paper, “Boost a Philatelic brother,” proclaiming, “a million stamp collectors want a stamp collector for President.” Seemingly concerned about capturing the stamp collector vote, then-President Hoover spoke at the convention of the Society of Philatelic Americans to declare that his entire family had collected stamps for many years even if he wasn’t actively collecting at the time. Discussing leisure time pursuits in the 1930s gave voters another way of identifying with the elite male candidates.1 These discussions boosted popular awareness and interest in stamp collecting. ¶ 5 Leave a comment on paragraph 5 0 Avid philatelists grew skeptical of FDR’s efforts to encourage collecting, after learning that the President and his Postmaster General, James A. Farley received their own sets of first-day issue souvenir stamps that would not be available for other collectors to purchase. In 1935, a Congressional inquiry asked the USPOD to respond to complaints by philatelic societies about this practice that appeared to give the executive office special privileges. While no Congressional action was ever taken, Postmaster General James A. Farley announced soon after the inquiry that any souvenir sheets printed by the Department would be made available for collectors to purchase through the Philatelic Agency. As demonstrated in previous administrations, philatelists closely watched activities of the USPOD to see how it influenced their hobby. Collectively, their voices were strong.